In my last blog article, I wrote about the reasons associations should blog. If you haven’t read it yet, check it out here: Why Should Associations Blog? Let us Count the Ways. In this article, I outline where to start once you’ve decided that a blog will benefit your association and its members. With over 1.5 billion blogs out there, starting a blog may seem overwhelming. Here are some things to think about when starting a blog for your association. The first thing to do when starting a blog is to decide which platform to use. Luckily, websites often have the option to activate a blogging feature. If your association has a well-kept website, then your platform decision will be simple. If your association does not have a well-developed site, you may want to choose a platform specifically for your blog. Two popular blogging platforms are Blogspot and WordPress. Talk to your IT support staff or web manager for more information and for help on making this decision. The next step is to decide how you want your association’s blog to look. One of the great things about creating a blog in WordPress, for example, is that you can change the entire layout and design of your blog with just a few clicks. Blogging platforms make it easy to determine the layout of your blog. If your association already has a website, it may already have a blog theme built in. Changing your blog theme is the simplest way to customize your blog’s appearance. It is helpful if you can enlist several (or all!) of the association’s employees and/or board members to come up with ideas for content. At our company, we have a rotating schedule where everyone takes a turn writing a blog article for publishing every week. There are several guidelines we all follow regarding word count, the use of “buzz words”, style, etc. Sharing the task makes it less daunting than one person taking on all the writing. Plus, sharing the task means your association will benefit from a variety of perspectives and expertise around the table. Everyone is an expert on some topic, so take what you know and write out your knowledge on a particular subject. Are you in charge of planning events for your association? Or do you deal more with the day-to-day operations and administrative tasks? Or do you work for an association management company that works with several associations, like Strauss? Every staff and board member in an association has a specific role, likely different from the others. Even those with similar roles will have different backgrounds, perspectives and experiences. Have you recently attended a conference or event where you learned a valuable lesson that would be of interest to others? Have you come up with a way to make a task or project more efficient? Both are great things to write about! Once you have decided on an angle, remember to add some personality. Nobody likes dry, boring content. Be sure to provide stories and examples in your post to make them more interesting and to put your own “spin” on posts. The title is the first thing that your readers will notice. People will be more likely read your post if they are intrigued by the title. Generally, short, simple titles are most effective, but try to include some information about what the post’s content. For example, a blog post entitled “Meeting Preparations” does not sound very exciting and could go in any direction; whereas “The Dos and Don’ts of Preparing for Association Board Meetings” sounds more interesting and the reader will know more of what to expect from the post. Remember not to give your article a title that will be misleading, just one to garner interest. Misleading titles are a sure-fire way for your audience to lose trust in the association! How long does each blog article need to be, you may ask? There are many different websites on Search Engine Optimization (SEO) that recommend different monthly word counts. I talked about SEO in my last blog post of this series. The key is to write around 750 words for each blog post (or 3,000 words/month), and longer if you want to appear in public searches more often. Posting weekly is best, but if you can only manage bi-weekly or monthly to start, then that is a great place to start. Finally, you might want to add an image or two to go along with your post. They say a picture is worth a thousand words, which isn’t to say that adding an image to your blog will make up for word count, but it will grab the interest of your audience! Try to find an image related to your topic, while also being thought-provoking to readers. If you set your image as a “featured image”, this will be the preview image everyone sees when they share the article on social media. So, choose wisely! After you have written your post and chosen images to include, the final step is to find someone to proof the article before publishing. Asking someone with a keen eye for grammar and punctuation is critical to presenting a polished end-product to share with the public. For more on what to think about when creating blog posts, visit Newfangled.com’s article on making your blog content worthwhile. So, you’ve published your first blog post—now what? Stay tuned for my next article in this series, when I delve into the most effective ways to share your association’s blogs and maximize its online impact. 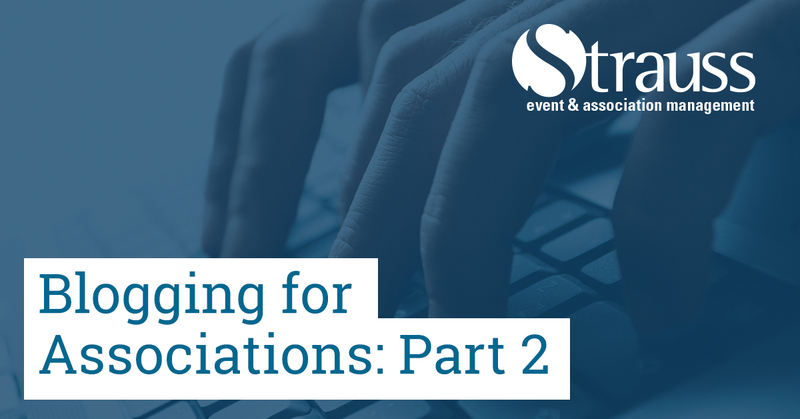 This blog is part two of a series on blogging for associations. In part three of the series, I write about the benefits of posting to your association’s blog regularly.